GLASGOW, Scotland (AP) — At a crossroads in his career, two-time Olympic triathlon champion Alistair Brownlee still wasn’t sure which way to go at the European Championships on Friday. Among the leaders until halfway through the running stage, the Briton ended up fourth as Pierre Le Corre of France won gold ahead of Spain’s Fernando Alarza and Belgium’s Marten Van Riel. Since retaining his Olympic title in 2016, Brownlee has been considering a move to longer-distance triathlons for a new challenge. He won his first middle-distance race in 2017, but with the Tokyo Games now two years away, Brownlee hasn’t made up his mind yet. Despite missing out on a medal, the three-time European champion enjoyed Friday’s race, his first of the season over the shorter Olympic distance of 1.5 kilometer swimming, 40K cycling and 10K running. “It was good I was still able to come out of the swim and ride well,” Brownlee said before adding he was “not very fit” after an injury-prone season in which he pulled out of an event in his hometown of Leeds in June with calf problems. Slovakia’s Richard Varga, the European sprint triathlon champion, was the fastest swimmer and played a significant role in a group of nine that went ahead from the start of the cycling. Varga, Brownlee, Le Corre and Van Riel did most of the work as the group extended its lead over the pack to well over a minute coming into the last transition. Varga quit the run early with an apparent calf injury as Brownlee, Van Riel and Le Corre continued to set the pace. However, Brownlee got into trouble after five kilometers and was soon overtaken by Alarza, who managed to catch up with the leading group. Alarza also went past Van Riel but posed no threat to Le Corre, finishing 11 seconds behind the Frenchman. Another 44 seconds later, Brownlee crossed the line in what will remain his only race at the Olympic distance this year. He will continue preparations for the middle-distance race at the triathlon world championships in South Africa next month. 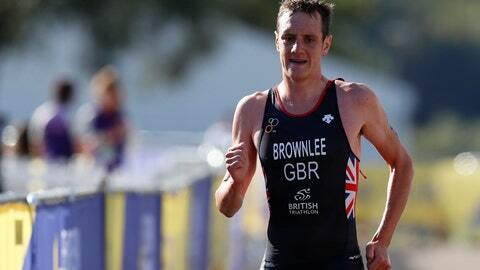 Brownlee will skip the final triathlon competition at the European Championships on Saturday, the mixed team relay, which will make its Olympic debut in 2020. In other events, British Open winner Georgia Hall and four-time major champion Laura Davies eased through the group stage of the women’s team event on the third day of golf, setting up a semi-final against Sweden’s Linda Wessberg and Cajsa Persson. In diving, world champions Evgenii Kuznetsov and Ilia Zakharov of Russia won gold in the men’s synchronized three-meter springboard with 431.16 points. They edged Olympic champions Jack Laugher and Christopher Mears of Britain by 0.54, denying Laugher a third gold after he won the individual events on both the one and three meter boards. Mariia Poliakova won the women’s one-meter springboard, leading a Russian one-two ahead of Nadezhda Bazhina.